Interlinear Hebrew Greek English Bible, Regular Print Hardcover, 4 Volume Set with 3 Volume 1985 OT & 2007 Interlinear NT w KJV, Jay P Green, Sr. - SGPBooks.com, Inc.
Interlinear Hebrew Greek English Bible, Regular Print Hardcover, 4 Volume Set with 3 Volume 1985 OT & 2007 Interlinear NT w KJV, Jay P Green, Sr. 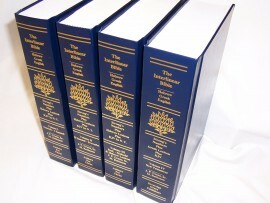 This has all of the content of the 4 Volume Interlinear Bible Set that has been published since 1985 plus the 2000 New Testament which adds an additional side column with the KJV. Instead of using an eclectic Greek text, this interlinear offers the Textus Receptus as restored by F.H.A. Scrivener and published by the Trinitarian Bible Society, thus a text virtually identical with that used by the translators of the King James Version. Improved typography and wider spacing for easier reading. Jay P. Green, Sr. (1918-2008) is Translator and Editor of The Interlinear Hebrew-Greek-English Bible and the translator of the Modern King James Version of the Holy Bible, The Teenage Version of the Holy Bible, and the Literal translation of the Holy Bible. He has written numerous books on textual criticism.